My son Santiago suffers from second child syndrome. Have you ever heard of that? It refers to how most second children don’t get the same kind of attention first children get. It’s not like I’m neglecting Santiago or anything like that, I just haven’t done the same sort of things I did with Vanessa at his age. For starters, I’ve been working full-time since right before he turned one, which means I haven’t had nearly as much free time with him as I had with her. We also stopped going to our bilingual children meetup once Vanessa started kindergarten, so Santiago never really got the chance to make any friends in the group. I’ve also noticed I don’t read to him as much as I read to her, although luckily, now that Vanessa knows how to read, she does a lot of the reading and Santiago loves it. Then, the other day he was giving me a hard time while I was trying to get him dressed for preschool when I decided to start singing “Arroz con leche” just out of the blue. Santiago LOVES music like no other child I’ve met and I was amazed that my singing worked wonders since he immediately came to me and let me get him dressed. But it broke my heart to realize that even though he wanted, he couldn’t follow along because he didn’t know the lyrics. How is is possible that my 3-year-old son can’t sing “Arroz con leche“? I felt terrible so I continued singing to see what other traditional children’s songs in Spanish he didn’t know. “Los pollitos dicen“? Barely. “Aserrín, aserrán“? Not a clue. “Tengo una muñeca“? Never heard of it. Seems like “Pimpón” was the only one he knew almost in its entirety. At his age, Vanessa knew how to sing all of the songs above and many more. I know it’s not the end of the world because I can still teach them to him, but it just got me thinking how crazy it is that I didn’t even realize he hasn’t really heard them all that much. 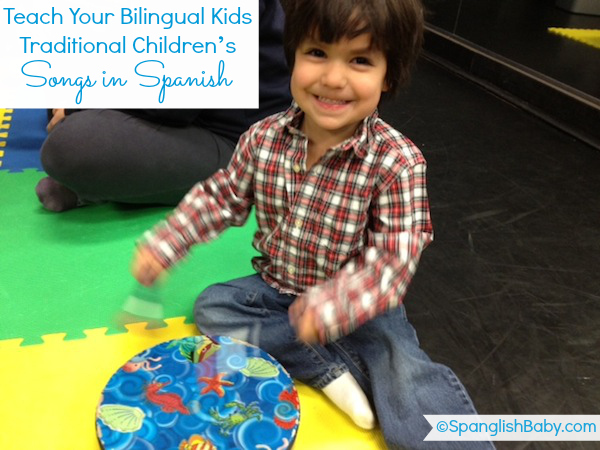 Music is such a great way of enriching a bilingual child’s vocabulary — and in Santiago’s case even more so since he’s so in love with music. So now we’re making sure we listen to all the CD’s we have with traditional children’s music in Spanish. Santiago has a CD player in his room, so I’ve just started playing these songs whenever we’re in his room and he’s totally into them. Teaching my son these traditional songs reminds me of my own childhood, and I can only hope that one day, when he becomes a dad, he’ll sing them to his child and remember his own childhood. By the way, if you don’t remember all the lyrics, there’s an amazing site called Mama Lisa’s Wolrd which includes all of them (with English translations) divided by country. Besides songs, you can also find nursery rhymes from all over the world. 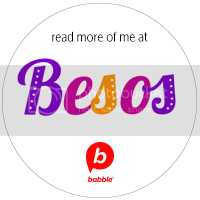 I promise that once you visit, you’ll be hooked and you’ll remember even more traditional children’s songs in Spanish. The two CDs we play the most in our house are Canciones Infantiles and Canciones Infantiles del Tiempo de la Abuela. 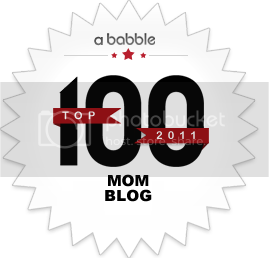 thank you for writing this post and including all those songs that i just realized i don’t sing to my son!! Glad you liked it! The two CD’s I listed include all of the traditional songs I grew up with and more. They’re definitely worth checking out to bring back all those memories! So a list is helpful! I take him to a Music Together lesson every week, but the majority of the songs are in English and he has pretty much learned them all by heart. I guess I just assumed he knew all these traditional songs in Spanish. Thank you for song ideas! I’m a non-native speaker and know very few songs in Spanish and in a pinch end up singing “brilla, brilla, estrellita” over and over again! I wanted to share a CD I found and love that never gets old. It’s called “Un pato en Nueva York” by Ines Canepa. Great, fun, unique canciones en espanol! Thank you for this post! I was a native speaker, but growing up my parents refused to speak spanish to us in order for us to integrate easily without an accent (my father has a very thick accent, which makes it difficult for people to understand him). Now that I have my boy, I still want him to appreciate that he is Puerto Rican, and despite his father or I not being able to speak fluent spanish, I can still sing to him in spanish. Yes, Alexandra! Anything helps and music is a great and fun way to expose kids to Spanish! You might want to check the Mama Lisa’s World link I included to get the lyrics and be able to sing even more songs! Gracias! Sólo leer los nombres de las canciones me devolvió a mi infancia, a cuando mi abuelita me cantaba, y me dio melancolía al pensar que yo no las he cantado ni una vez a mi chiquito. Estoy siguiendo el blog desde hace un par de semanas y quiero felicitarlas, es una fuente de información maravillosa. ¡Qué bueno que nos hayas encontrado y que te guste la información que has encontrado! Thanks for the list! Ill have to check all those out. I’ve always loved music and always sang songa to my daughter in spanisg, most that my mom sang to me and my siblings. I have a couple of recomendations, growing up I listened to a Record ( yeah those big round black ones) from a local publisher from my country in Dominican Republic called “Tra-la-la”.I recently aske my mom and she bought me the CD version, which has exactly the same songs even the same drawing design it had when I was little. I play it every morning on the way to my daughters day care and she loves it and signs alond the whole ride. Also my husbands grandma sent my daugher a DVD from Puerto Rivo from a local group that plays childrens sogns and does live shows called “Atencion Atencion”, she loved to watch it and dance and sing along. So both are highly recomendad if you can get your hands on them. Today I realized that I always sing the same songs to my daughter (pinpon, los pollitos dicen, aserrin, la pastora and mi escuelita) while this seems like alot specially for her age (15 months) I was starting to feel like one of these days I need to learn new songs. This list is so helpful. I will check all your suggestions out. Gracias! Thank you for sharing! I wish I would have done this sooner, but it’s never to late! 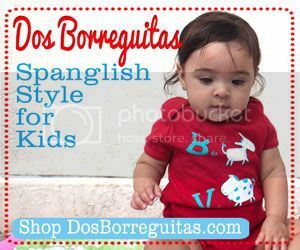 I am going to introduce the website to my fellow dual language parents! Excellent, what a web site it is! This weblog gives valuable data to us, keep it up. and you can find others that have hanging toys built regularly into them. very interesting article, I really enjoyed it!